Monday is the last day to register at the lowest available fare to this year’s Spring Value Investing Congress on May 6 and 7 in Omaha, NE, where Warren Buffett keeps alive the spiritual torch of value investing. (The Spring event was previously held in Pasadena, CA, but was moved because Charlie Munger no longer holds the Westco meeting in Pasadena). This year’s event is conveniently scheduled immediately after the Berkshire Hathaway Annual meeting at the CenturyLink Center (formerly the Qwest Center). Register here by Monday, December 19th and you’ll save $1,800 from the $4,595 others will pay later to attend. Remember to use Discount Code O12GB1. 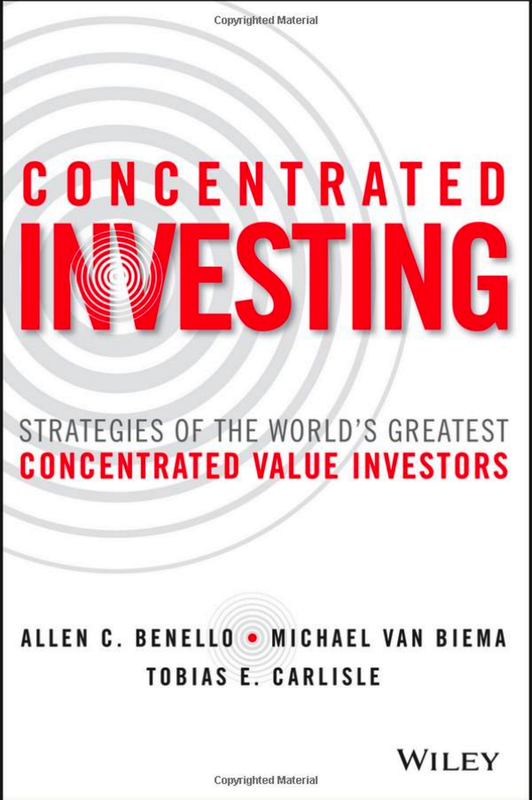 I’ve attend the last four Value Investing Congresses, and can highly recommend them. There’s nothing better than seeing an investor you admire explaining live his or her process for finding stocks. There’s also a chance they’ll sit down beside you in the audience, which Carlo Cannell did at the Pasadena event a few years ago. For more information on the speakers, click here. Disclosure: I get a commission if you buy through this link, which I will use to defray the cost of having Sting play at my birthday party the real, non-reggae versions of Police songs. Read more at Portfolio. I’d love to hear any other great lessons you might have learned in business school or otherwise. 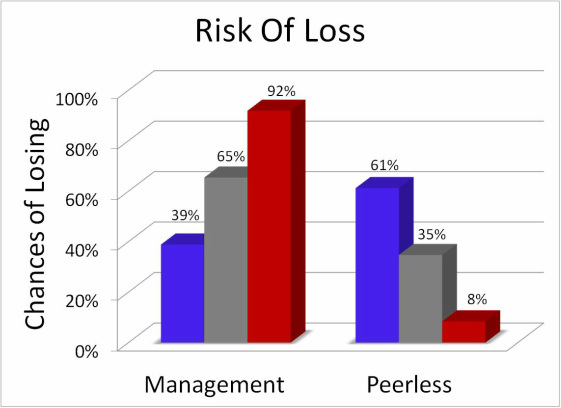 The mortality rate of hedge funds with more than a billion dollars of assets under management is very high. I think about that every time we rise to that level through retained earnings. I would like to think that we practice prudence over greed. Steller’s Sea Cow: Delicious, and easy to catch. How does the Sea Cow relate to investing? Cannell looks for companies that, like the Steller’s Sea Cow, have a difficult time adapting to a changing environment. He gave as an example a restaurant stock, which would have a more difficult time adapting to a slowdown in the economy than an oil and gas company. In the 2010 New York Value Investing Congress, Cannell expanded on his restaurant theme. He compared his search for short candidates in the restaurant industry to picking up roadkill on the side of the freeway, saying that he avoids them if they still have any life left, but if they’re dead, he grabs his shovel and sticks them in his portfolio. Another short anecdote: I was hanging out in the audience at the Pasadena Value Investing Congress in 2010 when Carlo sat down beside me. We had quick chat and he was lovely guy. Another hedge fund manager lamented to Cannell about the high cost of activist campaigns. Cannell’s response was words to the effect, “My activist campaigns are cheap. All I spend is the cost of the stamp to send a letter.” That’s really deep value investing. Cannell is speaking again at this year’s Spring Value Investing Congress in Omaha, NE on May 6 and 7. (The Spring event was previously held in Pasadena, CA, but was moved because Charlie Munger no longer holds the Westco meeting in Pasadena). This year’s event is conveniently scheduled immediately after the Berkshire Hathaway Annual meeting at the CenturyLink Center (formerly the Qwest Center). Register here by December 19th and you’ll save $1,800 from the $4,595 others will pay later to attend. Remember to use Discount Code O12GB1. 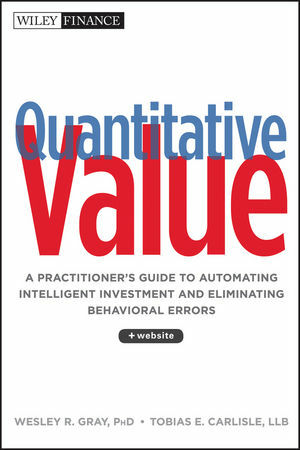 I’ve attend the last four Value Investing Congresses, and can highly recommend them. There’s nothing better than seeing an investor you admire explaining live his or her process for finding stocks. There’s also a chance they’ll sit down beside you in the audience. For more information on Cannell or the other speakers, click here. Disclosure: I get a commission if you buy through this link. You should know that every little bit helps keep me in the style to which I’ve become accustomed, by which I mean I buy the third cheapest bottle of vintage Champagne on the wine list, and all of my caviar is Sterlet. Above all, I am a deep value guy. Know that the commission is well spent. NEW YORK, NEW YORK, DECEMBER 6, 2011 – Carl C. Icahn today announced that Icahn Enterprises Holdings LP (a subsidiary of Icahn Enterprises LP (NYSE: IEP)), intends to initiate a tender offer for all of the outstanding shares of common stock of Commercial Metals Company (the “Company”) at $15 per share. Closing of the tender offer will not be subject to any due diligence or financing conditions, but will be subject to the redemption by the Company’s Board of Directors of the recently adopted “poison pill” and waiver by the Board of Directors of Section 203 of the Delaware General Corporation Law, as well as other customary conditions. The tender offer will be subject to there being validly tendered and not withdrawn at least 40.1% of the issued and outstanding shares of the Company. That number of shares, when added to the shares already owned by the offeror and its affiliates, represents a majority of the issued and outstanding shares of the Company on a fully diluted basis. The tender offer will include withdrawal rights so that a tendering shareholder can freely withdraw any shares prior to the acceptance of such shares for payment under the tender offer. Mr. Icahn stated that: “It is disappointing that this Board and management team rejected our all cash offer to buy Commercial Metals at $15 per share. I believe it was incumbent on the Board, and that the Board’s fiduciary duties required it, to allow shareholders to decide whether they wished to sell their Company. Our tender offer will be directed to shareholders and will require shareholder action. After attempting to work with the Board, we are launching this tender offer so that shareholders can decide for themselves what they wish to do with their company. We urge you to tender your shares. We have tried and failed to reason with the Board and management, and now it is incumbent upon you to voice your view and urge the Board to respond to shareholder demands. A strong tender offer response will send an unmistakable message to the Board that they need to redeem the poison pill and waive Section 203 so that the tender offer can close and shareholders can be paid immediately. All tendered shares will have withdrawal rights so that a tendering shareholder can freely withdraw any shares previously tendered prior to the acceptance of such shares for payment under the tender offer. The tender offer price represents a premium of 31% over the stock’s closing price on November 25, 2011 (the trading day immediately prior to our previously announced offer to acquire the Company), which was $11.45, and a premium of 72.6% from its low this year on October 3, 2011, which was $8.60. If a majority of shareholders accept our tender offer (including shares already owned by the offeror and its affiliates), we do not believe that even this Board will stand in the way of allowing a majority of its shareholders from accepting this premium if they wish to do so. However, if the Board, even after hearing from a majority of shareholders, fails to lift the poison pill and waive Section 203, we will leave the tender offer open and seek a court order compelling the Board to redeem the poison pill and waive Section 203 so that the shareholders can receive their money. We hope that even this Board will not decide to waste time and money fighting the will of shareholders in a courtroom battle. But, if they choose to do so, please know that we will fight this case all the way to the Delaware Supreme Court, and it is our belief, that we will prevail on the merits and that the court would order the Board to redeem the pill and waive Section 203 so that the shareholders can be paid. Obviously, the greater the amount tendered, the stronger our case will be. Commercial Metals has consistently been at odds with good corporate governance standards. Examples of the lack of good corporate governance that are blatantly hostile to shareholders abound and include: (i) the retention of a staggered board, (ii) the adoption of a poison pill without shareholder approval and at the extremely low trigger of 10%, and (iii) the refusal by the Board to allow shareholders to vote on whether our offer was sufficient. In addition, the 2011 ISS Proxy Advisory Services Report for Commercial Metals highlights numerous other areas of “High Concern”. ISS also noted that Commercial Metals sustained poor total shareholder return performance as determined by ISS’ standards. As a result of the Company’s poor performance, it is extremely important to send a clear message to the Board and management by tendering your shares. On Monday, we informed you and publicly announced that Icahn Enterprises LP would purchase Commercial Metals Company at $15 per share, in cash, without any financing or due diligence conditions. Disappointingly, it is Friday afternoon, the week is over, and we have still not heard from you. We are sure that you are keenly aware that since our announcement, over 22 million of the Company’s shares have traded. This represents over 19% of the Company’s outstanding shares, and is 200% higher than the average weekly trading volume over the past 52 weeks. To allow your shareholders to trade such heavy volumes without responding to our offer is completely irresponsible – but wholly consistent with the pattern of irresponsibility demonstrated by the Company over the years. Icahn Enterprises (which currently has, on a consolidated basis, $22.4 billion of assets, including in excess of $13 billion in liquid assets, which are cash and marketable securities) made a legitimate offer to acquire your Company, and to be clear, we continue to be immediately ready to meet with you to document the transaction. We are not asking for any due diligence or financing conditions. All that we are asking is that you allow your shareholders to decide if they wish to sell their company. We have received a number of inquiries from shareholders this week, as we are sure you have too. Shareholders deserve an answer; it is incumbent on this Board to respond to our offer. To that end, if you continue to disregard your duties and have not contacted us by 9:00 a.m., New York City time, on Monday, December 5, 2011, to schedule a meeting to discuss our offer, please be forewarned that we intend to take matters into our own hands. I am writing to voice serious concern regarding the alignment of management and shareholders of Adams Golf, Inc. (ADGF). First and foremost, we as shareholders are suffering a slow death, quarter after quarter, as we endure a consistent erosion of ownership. From December 31, 2006 to September 30, 2011, due to equity grants given to management (primarily CEO Chip Brewer) fully diluted shares have increased 31%. During that time, the company’s share price has decreased 31% and shareholders have received zero cash distributions. How that performance should entitle management to ongoing equity compensation for a “job well done” is beyond me. Our Annual Management Incentive Compensation Plan provides our named executive officers and key employees an opportunity to earn a semi-annual cash bonus for achieving specified performance-based goals established for the fiscal year. In 2009, 2010, and 2011 the Compensation Committee has established performance objectives for the named executive officers based on targeted levels of revenue growth and EBITDA (earnings before interest, taxes, depreciation and amortization). We believe that focusing on revenue growth is important because there are distinct advantages to revenue and profitability scale in the golf equipment business, such as the ability to advertise on network-televised golf events, to sponsor professional tour pros, and the ability to compete for strong research and development talent. We believe that focusing on EBITDA is important because it is the most widely accepted metric for the cash flow generated by a business. The performance objectives allow the named executive officers to earn a cash bonus up to a specified percentage of their base salary if Adams Golf achieves at least a specified threshold of the above metrics. In the long term, shareholders only benefit to the extent the enterprise generates cash available for distribution. In stating “EBITDA is important because it is the most widely accepted metric for cash flow generated by a business,” you are ignoring taxes, capital structure, and investments required in fixed and working capital. ADGF does not require much investment in fixed assets, but does require substantial ongoing investments in working capital. As such, EBITDA fails to account for these cash outflows necessary to support growth. A more sophisticated way to measure performance would be to look at the after-tax operating profit generated by the business in relation to the amount of capital investment required to generate those returns. From FY2006 through the last twelve months (“LTM”) ending September 30, 2011, ADGF has averaged a 4% return on invested capital. As I mentioned earlier, during this same period, the share price has declined 31%. Certainly some of this share performance is attributable to broader economic and financial market woes. In my opinion, however, ADGF’s share underperformance is due primarily to the ongoing dilution described above as well as shareholder value destruction caused by generating returns below the company’s cost of capital. My suggestion is to significantly overhaul the management compensation structure. Base management performance metrics on true creation of shareholder value (utilizing Economic Value Added or a similar metric), rather than simplistically focusing on revenue growth and EBITDA. The significant equity grants to CEO Chip Brewer have enabled him to build a sizable ownership in ADGF. 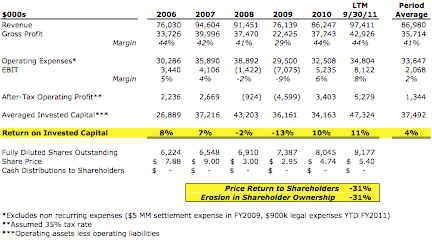 Mr. Brewer’s ownership on a fully diluted basis stood at 9.6% as of the 2010 proxy filing. Shareholders hopeful that Mr. Brewer’s ownership puts them on the same side of the table, however, are dismayed to find that since December 31, 2009, Mr. Brewer has purchased zero shares. During that same period, he has sold nearly 183,000 shares. This is hardly a ringing endorsement that we as shareholders have the CEO on our side. In quarterly earnings calls, Mr. Brewer frequently talks about “creating shareholder value.” He encounters the question of this ongoing shareholder dilution more frequently on these calls, but always sidesteps a true response to shareholder concerns. One wonders how consistently diluting existing shareholders at the expense of management while failing to earn an acceptable rate of return on capital creates shareholder value. I currently own slightly more than 1.5% of the fully diluted common equity outstanding. As such, while I certainly cannot influence any corporate decisions, I do take a keen interest in the affairs of the corporation. I am not representing a larger cabal or a hedge fund with greenmail or other ulterior motives. I would like to remain a long-term shareholder, but am reaching a level of frustration that will ultimately result in a sale of my shares if these concerns are not addressed. What I ask is that you as the largest non-management shareholders seriously reconsider the current management compensation structure. Adams Golf has a great brand name, has overcome its legal issues, and in my opinion has a very bright future as a continued leading and innovative golf equipment company. If the board of directors cannot truly align the interests of management, the board and the broader shareholders, you will be left with consistent shareholder turnover and a stock price that continues to lag, as no long-term investors will be willing to commit their capital to a partner they cannot trust to truly represent their interests. Disclosure: I am long ADGF. Earlier this week, I sent a letter to two of Adams Golf’s largest shareholders – the Gregory family and Roland Casati. I also published the letter on Seeking Alpha here. In the letter, I impored (sic) these shareholders to recognize the ongoing dilution and inadequate returns on capital generated by CEO Chip Brewer. On Thursday, the Gregory family and Mr. Casati released an SEC form 13-D, wherein Mr. Casati has irrevocably pledged to vote his shares with the Gregorys. In total, they represent nearly 35% of the outstanding equity. More importantly, they will be voting against Mr. Brewer as a director on the board in next year’s proxy, and indicated they may submit “other possible related proposals to present to the stockholders.” While vague, taken in context with the vote against Mr. Brewer indicates to me they are hearing the shareholder frustration. I can only hope my letter helped expedite what has been a long time coming. I love to see a small shareholder getting results.